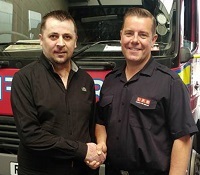 A man who suffered 98 per cent burns in a horrific fire has thanked the quick thinking fire crew who helped save his life. Constantin Huber was filling up a mobile generator with petrol in the back of his van when the fumes exploded engulfing him, his van and a shop front on Mare Street in Hackney on 11 January 2015. Thankfully Homerton's white watch were already nearby as they were just about to carry out a home fire safety visit. Firefighter Dean Lawson, who was first off the fire engine on the day said: "We were literally round the corner when we saw smoke rising nearby and quickly shot round there. "It only took a minute and I was rigged up and off the fire engine with the hose when I saw the van alight and a man on all fours. I quickly put a fine spray on him and he was saying 'No, No, No', and I was apologising to him. I didn't think he would survive. "At the end of the incident the paramedic came over and said that if I hadn't acted in the way I did he would have been dead." Mr Huber visited Homerton Fire Station alongside his carer, Ally, on Monday, 26 July to meet the watch who saved his life. He was introduced to Crew Manager Jason Croucher and Firefighters Billy Coyle, Michael Curnick, Brian Seaman, Dean Lawson, Paul Campkin, and Mark Bradley. When the blaze occurred, Romanian born Constantin covered his face with his hands and that is the only part of his body that wasn't affected by fire. Constantin spent two and a half months in a coma and another nine months in hospital. As far as his doctors are aware, he is the only person ever to survive 98 per cent full thickness burns. His remarkable recovery was made possible by an experimental new technique. This ground breaking approach has been made into a documentary that has been sent to doctors across the world dealing with severe burns. Firefighter Brian Seaman who also was at the incident said: "He amazed us all by his recovery and attitude and it reminds you when you moan about the simple things, other people are dealing with greater hardship. "Constantin is a true Superman, and is welcome at the fire station anytime."